I shared this freebie download on my monthly email newsletter earlier this month. It's a very popular booklet and widely available all over the place but just in case you don't already have a copy of your own, download it here for free! Sign up for the newsletter for monthly freebies, exclusive sales, coupons and vintage inspiration. This is a great book. It is how I learned to knit. Thanks for sharing. How splendidly sweet of you! I bought a copy of this very book at a flea market last year. 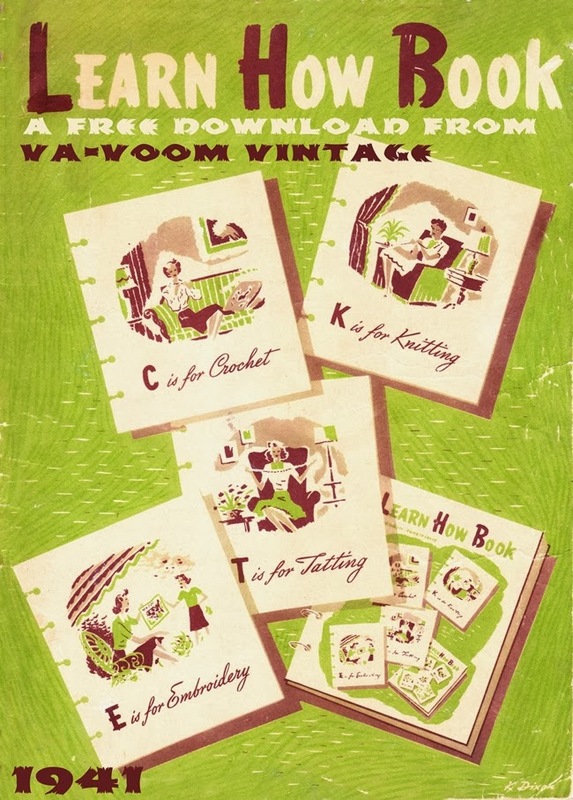 It's so charming (and I love that it includes tatting; I don't know how to tat, but it's always wonderful to see this classic, now largely forgotten, craft in a vintage book). Oh thank you!! This is the very book I first taught myself to crochet from in the '80's!! I had found the book at a yard sale and in fact, my very first thing to crochet ever was the shell stitch envelope purse... I have been thinking lately of the very first projects I ever made and searching for this pattern to no avail for nostalgic reasons...My what a sweet surprise to find it and a free download at that!!! Thank you so very, very much! !